Advertising & media industry critic, co-host of NPR’s “On the Media”, Bob Garfield, and co-author with Doug Levy, Founder and CEO, MEplusYOU, of Can’t Buy Me Like, will draw on their newly released book to show brand marketers how authentic customer connections drive superior results in their day one session at the 9th annual M2W® – The Marketing to Women Conference, April 15 – 17, 2013, Chicago Cultural Center. 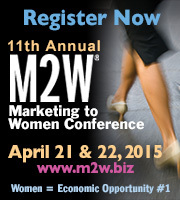 M2W®, part of Women Mean Business!™ Week, is the world’s premier conference on marketing to women. Since its founding in 2005, the event has been attended by thousands of senior-level brand managers and marketing executives from Fortune 500 companies representing major consumer product and service categories, including financial services, healthcare, automotive, housing, pharmaceutical, F&B, electronics, travel, retail, fashion, HBA, etc. The M2W® program features keynotes, general sessions, workshops, receptions and special events. Highlights include case studies and how-to sessions on topics such as media, creative, research, packaging, purchasing habits and point-of-sale interaction. Sponsors for the 2013 conference include Associate Sponsors: GfK, Linkage Research, Willoughby Design, Whitaker International, Anthem!, Mabel’s Labels, Conill, General Growth Properties and House Party; Workshop Sponsors: TRIS3CT, Insights in Marketing, LLC, Iron Girl and The Pert Group; and Showcase Sponsors: MEplusYOU, Female Factor, Healthy Initiatives Foundation, Lifescript, Snippies and Carolina Pad. For complete conference information visit: www.m2w.biz or call 860.724.2649 x14. M2W® is produced by PME® Enterprises LLC, 912 Silas Deane Highway, Suite 101, Wethersfield, CT 06109.